Dachshunds are full of all sorts of little surprises. They constantly amaze their owners with a variety of fun facts and not so fun issues. For instance, did you know that Dachshunds are bred in three different sizes? You might have a miniature if your dachshund is five or six inches off the ground. Or, a standard if pup stands at about eight or nine inches tall. Finally, you could have a Kanichen size that weighs about eight pounds. Full of fun facts. Unfortunately, this well-loved breed is also full of not so fun health problems. Poor joints, especially hips, are accompanied by lots of energy which typically means more serious issues arise before your furry family member is in their golden years. Another lifelong struggle your four-legged family member needs help with is a sensitive digestive system. The good thing is that aside from exercise and plenty of love you can help your Dachshund through maintaining a balanced diet. A balanced diet for your pet and the best value for you starts with a high-quality protein and fats that have Omega-3s and 6s. Because of their sensitive digestive system, it’s best to avoid dog foods that have too much fiber or too many carbohydrates. Because fiber and carbs affect the digestive track so much, keeping these in low percentages can make a huge difference in your pup and their transition to a different dog food. Also, avoid any foods that have an excess of synthetic nutrients that could be obtained naturally. It is common for dog foods to add L-Carnitine, and DHA because they are difficult to naturally bring into a diet. You’ll also want to avoid foods that are too heavy in carbs and fats because of the weight gain that usually comes with them. Dachshunds are easily susceptible to obesity and their poor back doesn’t handle extra weight well. Although you can’t use diet to indefinitely prevent weight gain, bone stress, joint stress, or digestive issues it is a good place to start. None of the options on this list are designed to treat these issues either. The top five picks listed here are thoroughly reviewed and their ingredients investigated. The needs of your Dachshund come first, and quality is what is being evaluated more than anything. When you need high energy to aid a Dachshund’s fast metabolism you don’t want to waste time with heavy fillers that will only lead to long-term weight gain. All these picks deliver on some or all the value points above. Keep in mind the size of your Dachshund as well. Some of these brands have additional “toy” options that might be more suited towards the smaller Dachshund varieties.Understanding the key points of each of these picks will help you chose what is best for you and your furry family member. Orijen is always a go-to when you’re looking for high-quality ingredients. Unfortunately, many pet owners can’t fit Orijen into their budget. Although it’s pricey, it is worth every penny. What isn’t to like about Orijen? The all-natural ingredients though are what sets this option apart from all the rest. Orijen takes it to the next level by sourcing their own meat. There aren’t any unnecessary or unknown sources of protein in this formula. Instead, they focus on providing a nutrient-heavy diet for their meat products resulting in a more nutritious food for your pup. On top of it, these are all things that you would find in a standard human diet. With an ingredients list that starts with “Deboned chicken, deboned turkey, and flounder” you’ll see familiar items. As with your own food, anything you see that sounds like it belongs in a medicine cabinet is best avoided. Orijen knows this and keeps all their ingredients incredibly transparent. You’re getting exactly what it says on the package. All-natural food, minimally processed and made with high-quality ingredients. Although we want a moderate amount of fat to avoid the Dachshund weight gain we don’t want fats this low. There is also the struggle with a unique taste. Many Dachshund parents will attest to their strong-willed nature. The effort necessary to change any aspect of a Dachshund’s life is astronomical, changing their diet is no laughing matter. This means that the unique taste can make Dachshunds extremely standoff-ish to the new taste. The solution is to introduce Orijen in a very slow and methodical manner. Finally, price. As this formula isn’t made particularly with Dachshunds in mind, or even small-breeds in mind it’s hard to justify this price. The quality is there but it’s missing key elements that we’re looking for in a good dog food option. It’s a general formula that is near perfect for small breeds. Taste of the Wild is known far and wide for its high-quality ingredients and unique formula that provides as natural a diet as possible. Everything your Dachshund would find in the wild is built into Taste of the Wild’s ingredients. Hence the name. With real salmon as its top ingredient, you almost couldn’t ask for more. But Taste of the Wild thought you would and didn’t want to disappoint with ocean fish meal and sweet potatoes as the next two ingredients. No grain, corn, wheat, or filler. This formula is really tailored for puppies and it makes a great option for the first two years of little puppy life. There are lots of proteins and high-quality fats which means high energy and the oils needed for their skin and coat. 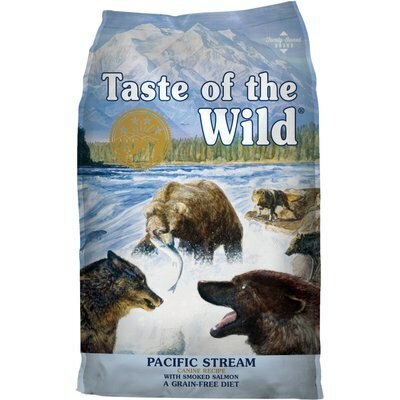 Taste of the Wild actively avoiding grain, corn, wheat, and other fillers mean that they’ve also inadvertently eliminated many common dog allergens. Other dog food options are usually packed with common allergens. The presence of those allergens contributes to what most pet owners believe is a regular or breed-specific level of digestive distress. Many Dachshund owners report that after switching to a grain-free diet their pup didn’t have as many digestive problems. There’s no guarantee that this is the problem your four-legged friend is facing. But, it’s worth a try, isn’t it? If there is anything you can attempt to help your pup out with digestive issues, a diet change is an easy attempt. 5% fiber is a little high for Dachshunds, but since it is coming from natural sources such as sweet potatoes and peas it is easier on their digestive system. What stuck out more as areas that pet owners would have concerns about is the calorie to cup count. Coming in at about 360 kcal to cup this is a premier opportunity for weight gain. For puppies, this is great, however, adult dogs don’t need this high of a calorie count per cup. For a ten to the twenty-pound adult dog, one cup is recommended. The concern is that your adult dog is going to be hungry and overindulge on treats or beg for more. Nutro has established many formulas based on achieving a peak balance of fruits, veggies, meat, and healthy grain options. 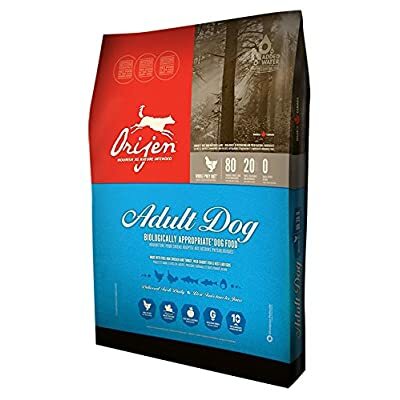 This small breed dry dog food has a kibble meant for smaller mouths. When your beloved Dachshund is ready to move on to a high-quality formula Nutro is worth a look. 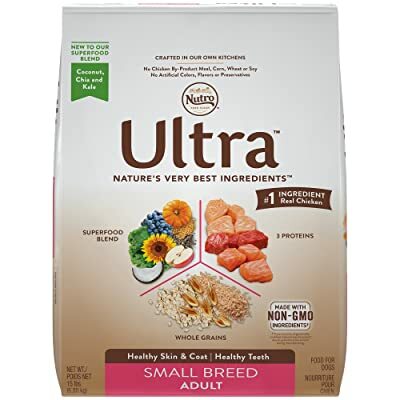 To support faster metabolisms of small dogs Nutro Ultra boosts their proteins and fats to premier levels. By avoiding all byproducts, corn, soy, and what they’ve reduced the window of opportunity for your pup to indulge in unknown allergens. These poor-quality fillers are usually full of allergens and avoiding them is a first step in the right direction. The combination of superfoods is the ultimate mix of additions to boost the nutrient-density. This ingredients list has tomatoes, carrots, flaxseed, blueberries, coconut, kale, sunflower oil, spinach, pumpkin, and apple. A blend of superfoods like this helps support not only healthy weight maintenance but also heart health. This formula works well for Dachshunds at any life stage. It’s also one of the more reasonably priced options. Because of the blend of superfoods, this has a unique taste that many pet owners have reported their dogs disagreeing with. What is always recommended is to slowly introduce new foods to your dog’s diet. Swapping out about a quarter of your dog’s daily dry food for the new food throughout the first week and then slowly increasing that through the next two weeks is the tried-and-true method for introducing a new formula. Otherwise, it’s completely normal for your dog’s digestive system to go into shock. No doubt your dachshund is smart and can tell when you swapped his food out on him. Don’t be surprised if you put down a bowl of new food of any brand for your pet to be suspicious. Another good trick is to blend the new dry food with a wet food that they’ve agreed with in the past. Although Blue Buffalo has come under some scrutiny recently it’s still a quality brand. Additionally, they have crafted many of their formulas around natural ingredients and have made many Corrections after inconsistencies were found and made public. The small breed option offers several benefits over the standard adult formula. Including a few of the value section aspects that we are looking for. The feature that sets this formula apart from the rest is the balance of proteins and fats. With a 24% minimum of protein and 14% minimum of fats, this is a steady ratio. The fat in this portion works to aid the protein in delivering pockets of energy. The whole grains at play here are brown rice, barley, and oats. This means that the grains present are also delivering high-quality fiber. As with the other options listed here, there are no fillers or artificial colors, flavors, or preservatives. So, although it’s nothing special these are still aspects worth mentioning. Even though Blue Buffalo Blue Life Protection covers a ton of necessary aspects for Dachshunds, there is still the looming reputation. Can Blue Buffalo recover from the lawsuit they settled in early 2016? For years Blue Buffalo claimed to provide only all natural, high-quality ingredients. They pulled in many consumers with their advertising who previously hadn’t put too much thought into their pet’s food. However, they admitted to the false advertisement and settled the issue legally. The struggle here is to now believe the quality of their ingredients is what they advertise. Although there’s nothing here on the label or price tag that doesn’t seem like a great match for a Dachshund, it’s hard to believe it. 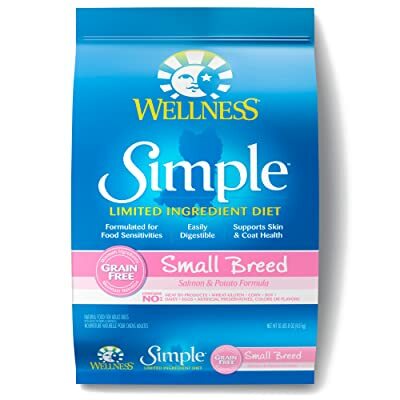 Wellness Simple Natural Limited Ingredients isn’t just made for small breed dogs. It’s also made for dogs that have food sensitives and digestive issues. Because the ingredients list is kept small on purpose Dachshund owners that deal with allergies and food sensitives have it made easy. This formula stands out for dachshunds particularly because of the small kibble size and that accommodates food sensitivities. Like the others on this list, it contains all-natural ingredients no fillers and avoids many of the common allergens that dachshunds suffer from. However, it has kept its small list of ingredients protein dense with about 14% fat and about 5% fiber. All this fiber content is a little high if your dog has digestive sensitivities this could be exactly what you’re looking for. To help your pump handle digestive problems Wellness simple for the small breed is worth consideration. Although wellness and both small breed with limited ingredients cater to both small breeds and digestive problems and misses the mark on many other needs at dachshunds have. It doesn’t address joint or bone stress or their skin health. This is a natural side effect of their very small ingredients list. Because their focus is on delivering easy to digest food the effort to deliver on aspects such as bone health heart health and skin health is lost. 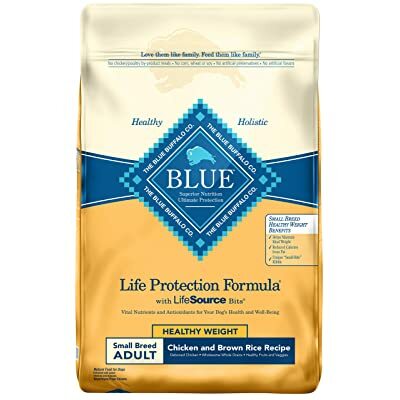 Blue Buffalo doesn’t disappoint in adult dry dog food overall the reasonably priced and provide many benefits to many breeds. Dachshunds have many similar issues that other small breeds experience as well. Because this is the only formula on this list that addresses joint health, provides small kibble, promotes skin health, and delivers a lot of energy it delivers the best value. Not to mention it is reasonably priced. Although Blue Buffalo has had a rocky reputation in the past they’ve made a comeback. The complaints throughout the last year have diminished significantly when compared to 2015 and 2016. This one’s giving Blue Buffalo another chance.